There are many reasons to hire a Limo bus or a limousine, but people never think about using this awesome service for a brewery tour. The Washington DC area has some of the best brewery tours in the nation and our fleet of new buses is the way to go! When taking the brewery tours, no one wants to be the designated driver! By using a limo bus, our experienced and qualified drivers will gladly take that position. You can taste all the beer you want. 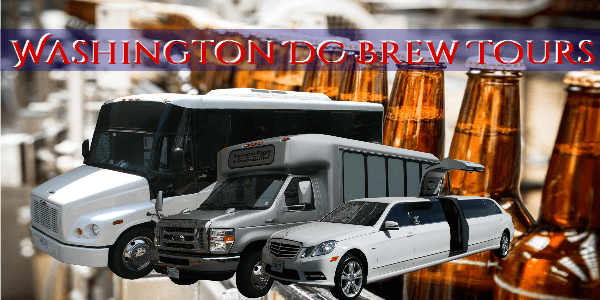 Today’s brewery Washington DC Limo Tours are a step up from the boring wine tasting events of the past. Start your party while on the bus! Enjoy your adult beverages. Enjoy the fantastic sound systems. The limo bus is like a club on wheels. The ambiance is exciting. Limo buses are all about fun. It is about good friends, good times and a unique experience. When you add beer tours, it is a no lose situation. You will enjoy up and coming breweries, as well as some old and well established breweries in the area. Sip your way through the world of beer. Discover what hops taste like. Learn about aging the barrels or just watch the action when the cans are being filled packaged. Brewery tours are fun, exciting and educational. After sipping your way across the area, join your party on the road. We will make sure you get where you are going safely and legally. We will do all the work, all you have to do is call. REMEMBER if you do not see what you are looking for we can customize it!